"The plan which I suggest is a great London University," wrote the Scottish-born poet Thomas Campbell to The Times on 9 February 1825, in a letter specifically addressed to Henry Brougham (Rector of Glasgow University, and the future Lord Chancellor). What he envisaged was an institution "for effectively and multifariously teaching, examining, exercising, and rewarding with honours in the liberal arts and sciences the youth of our middling rich people between the ages of 15 or 16 and 20 or later." Days after the letter appeared, Campbell was met by Brougham, James Mill (Bentham's protégé) and others, and shares began to be issued for a new university. 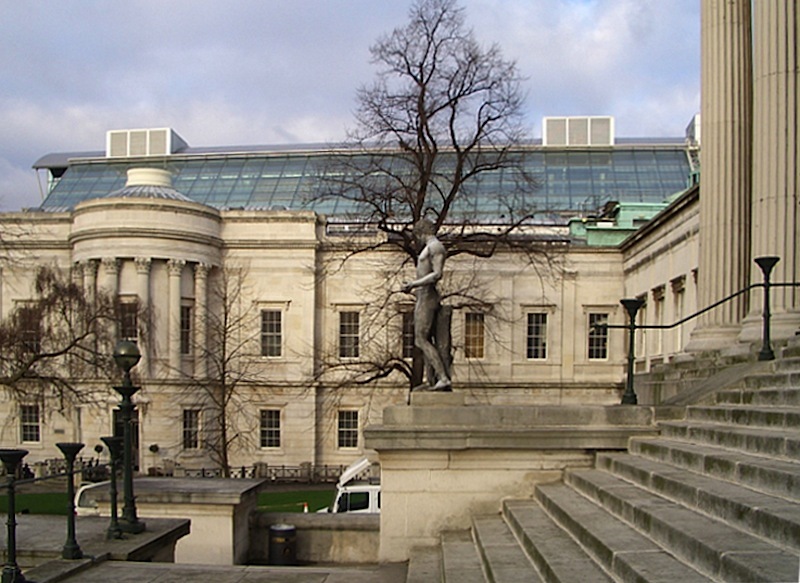 With the backing of Dissenters, Jews and Utilitarians alike, what would become University College, London, was founded early in 1826. The first stone of its imposing Bloomsbury building was laid in 1827, "with great solemnity and amid much popular sympathy." These are the words of Harriet Grote, the (then) young wife of George Grote, the youngest man on the founding council. "This event may truly be said to have formed an epoch in our domestic history," she continues. "Much sensation was occasioned by it, not only in England but on the Continent.... The fact was, that the Dissenting body were now becoming powerful enough to insist upon having a superior education for their sons; the exclusion of whom from the English Universities [i.e., Oxford and Cambridge] had long been felt as a serious grievance" (55-56). The very fact that the new establishment was to be secular, and yet obstinately laid claim to university status, drew down the wrath of the establishment. Another contemporary describes "the general disapprobation with which it was regarded by both Tories and Churchmen, on account of its secular and unsectarian principles," saying that "the storms of opposition which raged around it threatened to crush every spark of vital energy which remained" (MacIlworth 32). But the sparks were not so easily crushed. The Rev. 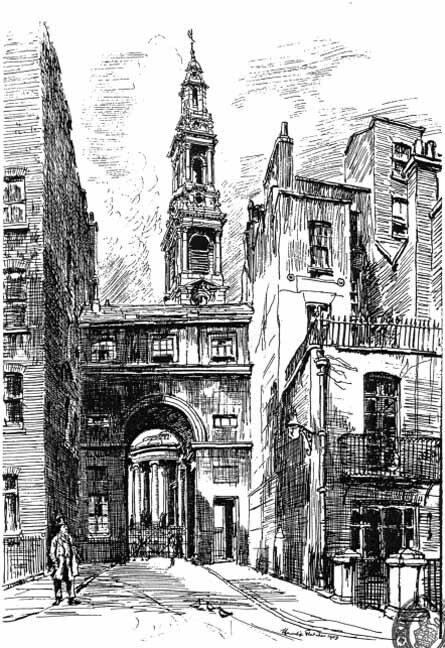 Dr. George D'Oyly, rector of Lambeth, who took particular exception to what was going on in Bloomsbury, therefore published an open letter proposing another establishment in the capital — one in which Christian principles would be instilled, and "the services of religion ... performed as directed in our National Church" (qtd. in Hearnshaw 38). Under the patronage of King George IV, and with the active support of his then Prime Minister, the Duke of Wellington, plans for a rival Anglican institution were duly launched in the summer of 1828. Wellington's support was so active that he accepted the Earl of Winchilsea's challenge to a pistol duel over it (the Earl was also enraged by Wellington's support of the Roman Catholic Relief Act). This duly took place on 21 March 1829, Luckily, only a token shot was fired, followed by an apology, and the project for King's College, London, proceeded as planned. An amusing cartoon of the time shows the supporters of each college on a seesawing plank, laying into each other with gusto. 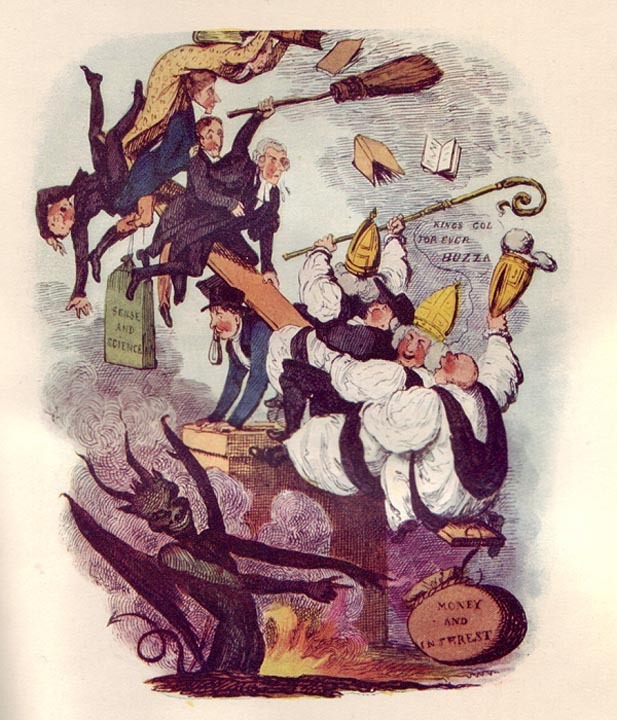 Brougham, to the fore of the Dissenters, wields a broomstick, while the very elderly Jeremy Bentham, his dressing gown flying, dispatches a hail of books at the enemy from the rear. On the other side, the Archbishop of Canterbury brandishes his crosier, the Rev. Dr. George d'Oyly hangs on tight, and one of the plump bishops behind him yells, "KINGS COL FOR EVER HUZZA" (qtd. in Hearnshaw 42). The slender ballast of Sense and Science on Brougham's side is quite outweighed by the fat sack of Money and Interest on the other side, at which the Devil himself leers gleefully. At any moment the already hefty prelates might dip into the fires of hell below them, in which case, ironically enough, their skinny "godless" rivals would be catapulted up into heaven (though one man has already fallen off). Feelings ran high in those first years. At any rate, both foundations went ahead. Although only the central part of its building was complete, the "godless" place in Bloomsbury, which persisted in calling itself London University, opened its doors in 1828. It is unfair to suggest, as Peter Ackroyd has done, that its aim was solely to "train engineers and doctors": for example, philosophy was on the agenda from the start, as were modern foreign languages and English language and literature — "especially notable innovations" at the time (Harte and North 58). There was even a chair of Hindustani. It is true, though, that its founders had no interest in producing "scholars and divines" after the Oxbridge model (Ackroyd 512), and that was its great attraction. 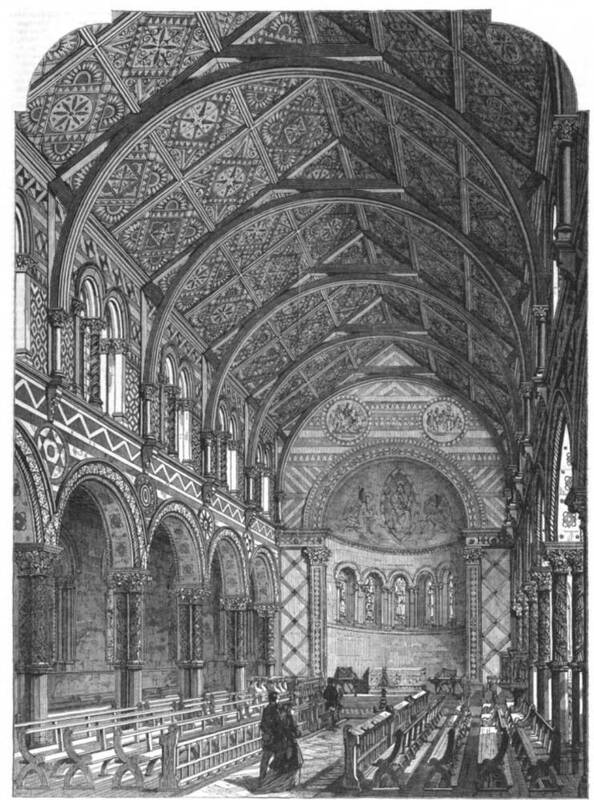 King's, with its chapel ostentatiously at its very heart, was also only half-finished at the time of its opening ceremony on a gloomy October day in 1831. Here too there was a clause in the prospectus which "enabled nonconformists of all sorts to enter the college freely" (Hearnshaw 80), and here too a new range of subjects was on offer, including chemistry, English literature, the principles of commerce, and so on. In other words, there was not quite such a big difference between the two as might have been expected. Three Views of King's College, London. Left: The Old Gateway. Middle: The College Building in 1833. Right: The Chapel. Click on images to enlarge them. With both institutions admitting students now, some sort of equilibrium was achieved. This was helped by the fact that Brougham, chairman of the governing body of the Bloomsbury establishment, had automatically become a governor of King's as well on taking up his appointment as Lord Chancellor in 1830. He then diplomatically professed to having had warm feelings towards it from the start. The two colleges were also drawn into uneasy alliance by the problem of granting degrees, a particularly acute problem for the medical students who wished to practice. Even King's, which had received its Royal Charter promptly in 1829, had no power in this respect, while "London University," as it persisted in calling itself, still did not even have a Charter. The two colleges now had to eat humble pie, and accept that no government was likely to approve of two separate degree-awarding establishments in London. 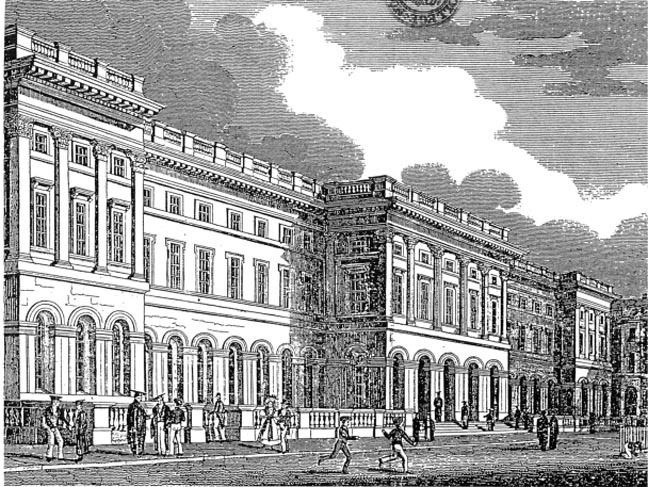 The outcome of negotiations was that in 1836 "London University" accepted a lowlier designation, becoming known from thenceforth as University College, and William IV granted a separate examining body the right to confer degrees on the students of both University College and King's-and those of any other approved colleges and institutions as well. This was the new, true University of London. The way was open for the huge academic organisation, global as well as federal, which was to come. Nevertheless, it was not until the University of London Act of 1898 that this degree-granting body was also accepted as a "Teaching University," with both internal and external examinees. The complicated evolution of this as well as other universities like Durham, Nottingham and Manchester has led to a lively controversy over which university is really the third oldest in England after Oxford and Cambridge. King's probably has the strongest claim of all, since Durham only got its Royal Charter in 1837, and the others also lose out on technicalities. But it has to be remembered that in those early years King's sent its students on to Oxford and Cambridge to take their degrees — while, despite its claim to be a university, the rival establishment in Bloomsbury could only award certificates. 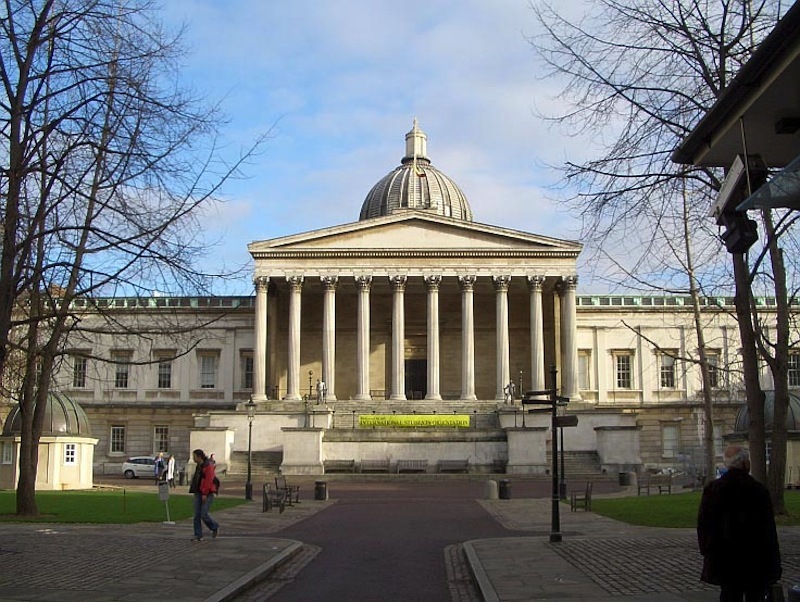 As for the University of London as a whole, whether it can be traced back to the founding of its first constituent college in 1827, or, perhaps more fairly, to its establishment as an examination board in 1836, or only to its full recognition as a teaching institution in 1898, about one point there can be no disagreement. Overtaking Oxford and Cambridge in sheer number of students, by 1908 it was the largest university in Britain. Ackroyd, Peter. London, The Biography. London: Vintage, 2000. Campbell, Thomas. "Propòsal Of A Metropolitan University, In A Letter To Henry Brougham, Esq." Times. 9 February 1825: 4. Times Digital Archive. Web. 5 February 2018. Grote, Harriet. The Personal Life of George Grote: compiled from family documents, private memoranda, and original letters to and from various friends. London: Murray, 1873. Harte, Negley. The University of London, 1836-1986: An Illustrated History (London: The Athlone Press, 1986) . Harte, Negley, and John North. The World of University College, 1828-1990. 3rd ed. London: University College, 2004. Hearnshaw, FJC. The Centenary History of King's College, London, 1828-1928. London: Harrap, 1929. Lobban, Michael. "Brougham, Henry Peter." Oxford Dictionary of National Biography. Online edition. Web. 7 February 2007. MacIlwraith, W. The Life and Writings of George Grote: An Essay. Wolverhampton: Barford & Newitt, 1884. Third Oldest University in England Debate. Web. 6 January 2007. University of London website. Web. 5 January 2007.